An important concept in future healthcare is the development of devices called “lab on a chip”. These “chips”, not related to the electronic ones found in computers, are small devices in which biological fluids – blood or urine for example – are injected to fill specifically designed microscopic channels. These channels would contain biosensors which could detect for example specific markers for diseases within the fluid and provide a quick diagnosis. A large array of analyses could be performed on a device a few centimeters square. However, an arising issue is the size of the fluid sample injected inside the chip, with tiny volumes down to a billionth of a liter. Due to lack of available technologies, researchers do not yet fully understand how fluids – particularly complex ones of biological origins - behave at such small scales. Prof. Amy Shen and her team members from the Micro/Bio/Nanofluidics Unit at OIST have focused their efforts on using microfluidics as a tool to reveal the laws and principles ruling the behavior of complex fluids at the microscopic scale. Then in a second phase, they make use of these discoveries to provide direct applications in healthcare and biotechnology. Their recent findings can be found in the Journal of Rheology from the American Institute of Physics. 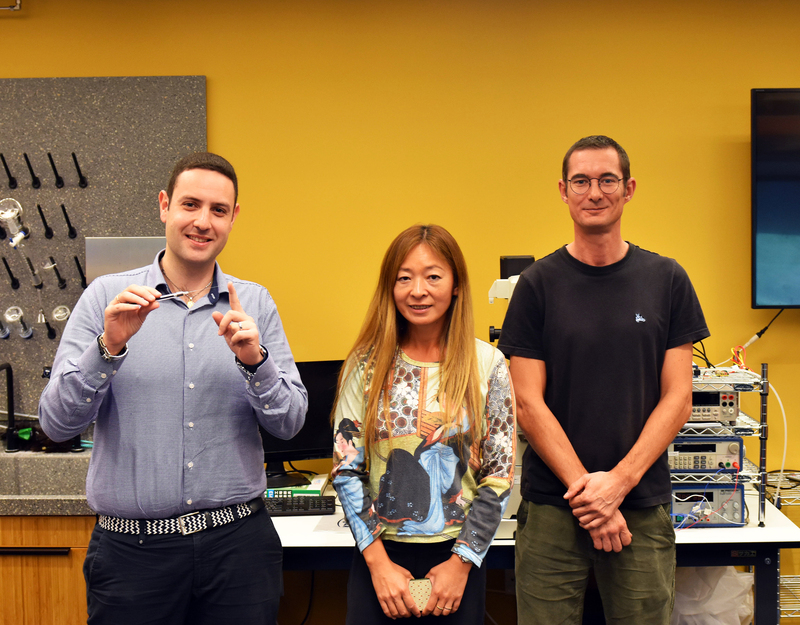 (from left to right) Dr. Francesco Del Giudice holding a microfluidic device, Prof. Amy Shen and Dr. Simon Haward from the Micro/Bio/Nanofluidics Unit. Polymers are large molecules built from many repeated similar units. They are omnipresent in everyday life, making up most of the synthetic materials that we use, from fabrics to rubber and polystyrene. Liquid polymer solutions can be found in many commercial items from household cleaning products to paint. But it is at the microscopic scale that polymer solutions could drastically improve diagnostic tools. “When you add a polymer to a suspension of particles in water, you trigger a new phenomenon in the microfluidic channel”, Dr. Del Giudice explained. “These polymers start acting as springs to kick particles or cells in the suspension, pushing them towards the middle of the channel and promoting their alignment.” Being able to arrange particles or cells within a microscopic channel represents a huge improvement for the use of biosensors in healthcare diagnosis. Polymer solutions could even separate and sort out by size different components in a complex biological fluid - for example blood, composed of cells and aggregates of many sizes – within a single microfluidic chip. But this phenomenon is highly dependent on the nature of the polymer itself. It takes time for the polymer in a dilute solution to return to its original shape after it being deformed by the flow. This delay, called the relaxation time, is a critical parameter to measure in order to describe polymer behavior. Today, current techniques to measure relaxation times are limited by the sensitivity of the available commercial instruments, which are only able to measure relatively long relaxation times such as those of concentrated polymer solutions in large volumes. In their work, Dr. Francesco Del Giudice and Dr. Simon Haward designed microfluidic devices to observe polymer deformation and relaxation within micrometer-wide channels. These platforms enable researchers to stretch or shear polymers at will using low volumes and low concentrations and to record the reactions to those forces. In this way, they can characterize dilute polymeric fluids with even very short relaxation times, and thus have a much better idea of their behavior at the microscopic scale. 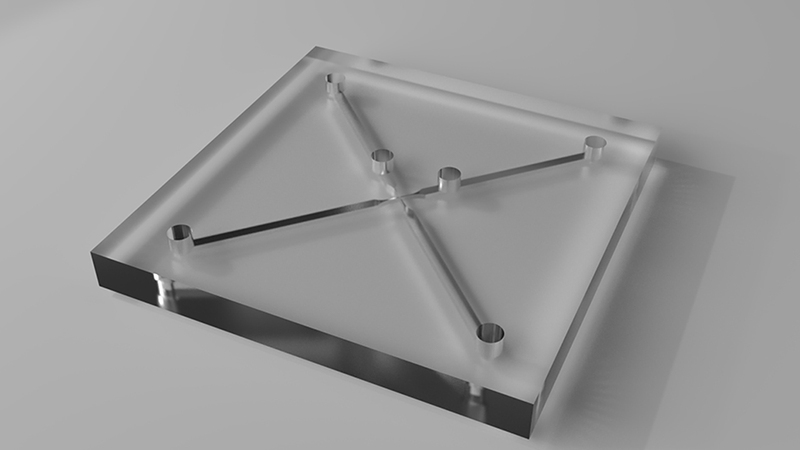 A 3-dimensional rendering of a custom-designed palm-sized microfluidic platform that enables the stretching of polymers in dilute solution in order to measure their relaxation time, i.e. the time it takes for these polymers to return to equilibrium from a deformed state. The relaxation time is a critical indicator of the behavior of a polymer molecule in solution. Using these new microfluidic tools would allow researchers to generate a catalogue of diverse polymeric fluids whose relaxation times are known. With such a database at their disposal, scientists could then pick a polymer appropriate for the alignment and/or separation of molecules within the biological fluid they want to study inside their chip. “This way, understanding polymer solutions will allow you to create a high throughput platform on a chip made of several different modules, each performing different analyses” added Dr. Del Giudice.